I just won my first solo PLAYERUNKNOWN'S BATTLEGROUND (PUBG) match. It feels great! So great that I've decided to write up this blog post on how you too can win your first match. As you may have already noticed by the screenshot above, I'm not a very good player. But I like playing, because it's a new style of shooter for me and I get to play with some awesome people. The plan entered from the north with a heading towards Mylta and Novorepnoye. I decided to get out at Yasnay Polyana. Most people who jumped with me headed towards the school and Rozhok. I had one or two other people head to Yasnaya Polyana with me. I never saw them. Looting the town, I ended up with an AK, an UMP, and a ton of healing items. I modded out both weapons decently. The only thing I was missing was a barrel attachment for the AK. On the armor side, I had level two backpack, helmet, and body armor. While looting I heard a car drive up and the player get out. I froze at this point and stopped looting the house I was in. I was making sure to close doors of the buildings I was in so I could hear anyone coming in. I waited around for him to enter one of the two doors, but he never did. Eventually, I got the courage to head to the roof for a look around. No one. I finished looting the house and headed north across the street. I had lucked myself inside the circle. I was confident that no one was coming from the North. They'd either come from west or south. I started looking for mods in the north side of town. As I found an SMG suppressor for the UMP, I suddenly noticed that the blue force field was running in on me (Whoops!). I jumped off the roof of the building I was in and started heading south. Across and open field with my pistol out. Right before I left I had heard gun shots to my east so I was watching that direction by using the ALT key while I ran. Shoot I forgot to grab the SMG suppressor! Situational awareness and sound are very important in this game. Most games I'll have music going in the background (Thank you Amazon Prime Music!). This game I don't. I make sure the game volume is at 100% and any chat programs are at 50% or less. This allows me to hear vehicles, footsteps, and gun fire. You can run slightly faster in the game with your pistol out verse running with no gun out (default key X). Don't ask me why that is, I don't know. We tested in game the other night and the person with the pistol looked like they were running slightly faster. While running or standing still you can look around your character with the ALT key. This allows you to spot enemies in the distance or around objects like trees. I don't bother with the first person view in the game. Once the blue force field passes your character starts to take damage. This is so that games move along and don't turn into camp fests. The more shrinks there are the harder the blue hurts. This was only the second shrink, so I wasn't taking a ton of damage, but enough to concern me. I made sure to take painkillers and red bulls before the blue overtook me. Two of those will also help make you run faster while healing you over time. I eventually did make it out of the blue, with just enough time to take a first aid kit and another red bull (it gives you wings!). The blue was shrinking again and I had to move. I made it to the next white circle just as the blue got there. Is I entered the white area, I immediately looked for cover. I now had some time to breath and listen for gun fire. There was quite a bit off to my left. I hadn't fired a shot at this point, so I had plenty of ammo. I was hesitant to shoot anything as I didn't have a flash hider or a suppressor for my AK. Any noise from me would draw attention. A vehicle came flying into the zone, but he was flying up the hill and too far of a shot for me. He was getting peppered by others to my west so I focused there. I saw a gun running across the field. With a clear shot I started firing at him. After three hits he went prone and I finished him off. The blue was about to move again so I started skirting the next zone east because it had more cover and the action was to my west. Another car drove up and stopped near the road. The drive was out and I started taking shots at him. This time I missed all my shots and he went for cover behind a rock. The blue was moving in and I headed back west to get behind a tree. Shoot! I have to cross the road. I decide to take some damage and see if the guy will pop his head out. No go. I moved into a different rock just a few feet from his rock. He wasn't popping out so I started using a first aid kit and used ALT to look up over the rock. He's throwing a molotov cocktail. I move and cancel the first aid kit. The molotov lands behind me. I start using the first aid kit. Now he's moving out on me. I decide to pop out and rush him with the AK, despite having half health. I think he had an UZI, because I wasted him. I moved behind a tree into the next circle. At this point there are four players left. I heal up and start chugging as many red bulls as possible (usually two). I see a guy prone moving in from the west. He's moving into an area where my view is blocked from trees. I decide to note his location and hold off firing any shots. I hear a Kar98k fire and kill someone to the south of me on top of the hill. I'm in the circle at this point and don't need to rush anything. There are three players left now. The guy from the west has a long way to go. I have a good idea of where he is and what route he'll take. I know someone is on top of the hill, but I don't have a very good location. I wait to see if the guy south will fire and give me a better location. A few seconds later I have my answer. The zone shrinks again and I'm still on the edge (thank you RNG gods!). The guy ontop of the hill takes out the guy to my west. I have the advantage now. I'm in the zone and he has to come to me. The last guy probably doesn't have a good fix on me. I watch to the south and see him start moving down the hill. In the open! I lean right by hitting E and starting firing. I miss all my shots. I have the AK on auto, even with my 4x scope. Double tapping with the AK at distance is surprisingly effective. But not effective enough here. He's behind the tree opposite me at this point and I'm scoped in. I'm still just leaning, because It exposes less of my body. He peeks right and I miss. He peaks left and I miss. Finally (for whatever reason) he pops out from behind the tree. Two shots later I'm the chicken dinner winner! The easiest and fastest way to loot in the game is to hit TAB and drag the items over you want. I recommend starting at the bottom of the list, because pulling from the top will move all the below items. If you're grabbing them all, grabbing from the top is fine. Mods are important for weapons in this game. If you have a suppressor, you can take more difficult shots, because it will be harder for players to get a location on you. Seeing as I was without one, I decided to be more picky about my shots. Scopes and sights are important. There are tuns of holographic and red dot sites available in the game. They replace sites which are very difficult to shoot from. 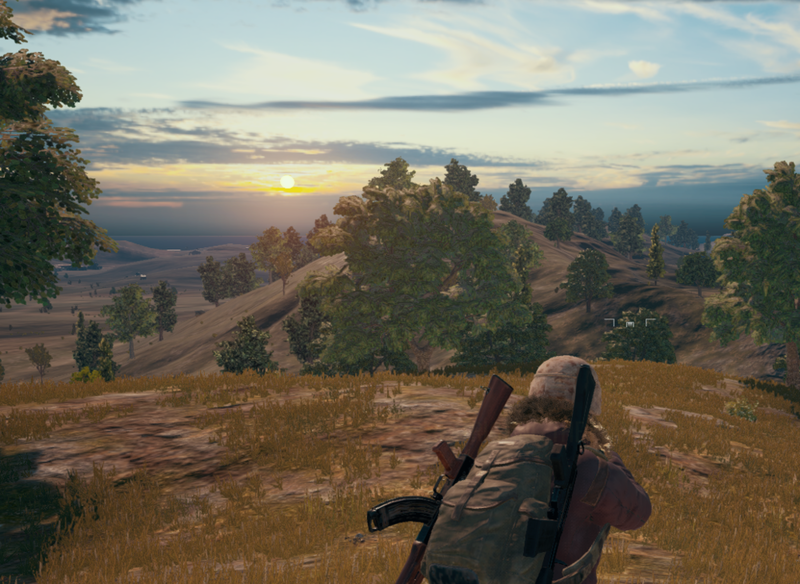 The game has 2x, 4x, and 8x scopes. 4x scopes are the middle ground and you want at least one assault rifle with them. 8x are best with sniper rifles. I've used one with an m416 with great success. My reaction to footsteps, doors opening, or vehicles is to crouch by using C and then hold right click. This zooms downs the site in third person. It allows for better aim and makes you walk. Combined with crouch this allows you to move around with out creating a lot of noise. I've played the game for over 60 hours and I'm still not good. I am getting better. The game is fun, especially, if you can group with a squad (hit me up on Twitter if you're looking for one). It's very nuanced and takes a lot of practice. Jumping out of the plane is a lot of work. Heading straight down gets you to places quicker, but landing with a parachute is a whole mini-game in itself (AIM FOR THE ROOF!). Crap landed in a tree again (or worse fall of the roof and take fall damage). If you're patient enough with the game, though, you can win too. If you're interested in joining our GamerSec Google Group, hit me up in email (timothy.deblock[at]gmail[dot]com or reach out to me on Twitter (DMs are open) for an invite.